Unlocking Wonder in "The Golden Key"
view gallery of Ruth Sanderson's illustrations for "The Golden Key"
MacDonald incorporates, transforms, and invigorates one of the oldest, most fundamental of all literary forms…These familiar narrative elements are here put to work in the service of a “new mythos,” so that the fairy tale becomes a means of symbolic discourse in which MacDonald attempts to expound his own unique vision (40). Just as the human spirit cannot be defined in its complexity, the gestalt of George MacDonald's story "The Golden Key" washes over the reader in waves of numinous, mythopoeic images that, taken as a whole, convey more meaning than do the individual images and scenes. And most importantly, for those readers who are drawn into the world of this undeniably eccentric Victorian fairy tale, the story elicits a powerful emotional response. One of the first aims of any good fiction writer—past or present—is to engage the reader's emotions. As the characters yearn for the land from where the mysterious shadows fall, the reader yearns along with them. 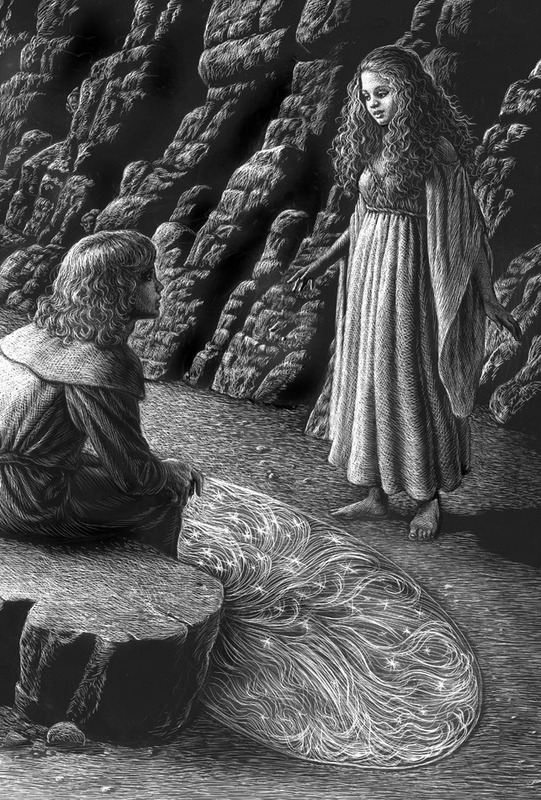 Along with creating an emotional connection, the story's unique and evocative imagery is also intellectually fascinating, and inspires the adult reader to wonder what these images might represent on a symbolic level. In this essay I will examine the numinous qualities of "The Golden Key," explore some of its symbolism, and the ways in which this story differs from a traditional fairy tale. Finally, I will present my long-time connection with the story, and my visual interpretation/extension of the symbol of the golden key itself. The story begins with a boy named Mossy listening one night to his Great-aunt's stories, fascinated by the tale of a magical golden key. The reader learns their house lies at the edge of fairyland. One night, the boy sees a rainbow that shines on after dark, finds its source, and discovers the golden key. In the same village, a young girl named Tangle is frightened by the fairies and runs into fairyland also, where a tree captures her in its branches and she is freed by a mysterious creature, the air fish, before she arrives at the cottage of a wise woman. She is bathed, and to her astonishment the air fish is cooked and eaten, then transforms into a small human-like winged creature called an aeranth. The next day Mossy appears at the cottage and the two set out on a journey to discover the keyhole, and what lies beyond the door it opens. In their travels they come upon a valley made up entirely of marvelous shadows, without seeing the subjects casting them, and long to travel "to the country whence the shadows fall" (78). They grow to old age while there, and are ultimately separated. Their journeys continue singly. Tangle travels down into the earth, encountering the Old Man of the Sea, the Old Man of the Fire and the Old Man of the Earth, who appear to be the opposite age of their title, the oldest man of all appearing as a wise young child rearranging colored balls in a significant way. 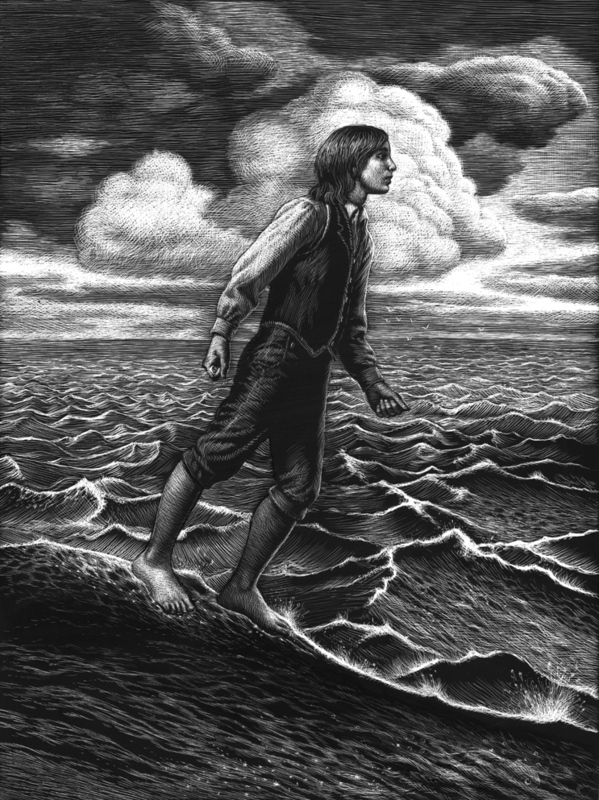 On his journey, Mossy rightly recognizes the Old Man of the Sea as death, and he gains the power to walk across the sea. After climbing a precipice, he enters a chamber where the colors of the rainbow appear as columns of light. 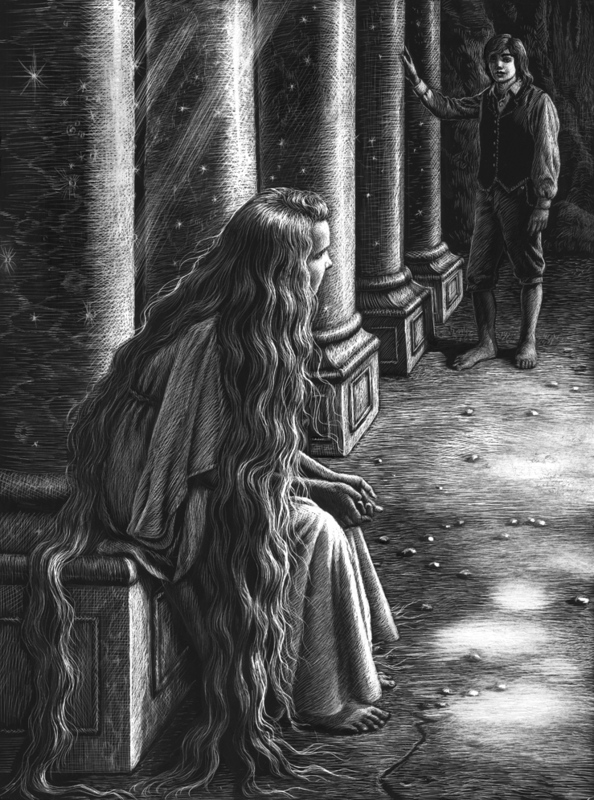 Tangle is waiting for him, seated on a column with her hair flowing around her like a river. The column reveals a keyhole, and the two enter the rainbow and climb the stairs "to the country whence the shadows fall" (78). What he does best is fantasy—fantasy that hovers between the allegorical and the mythopoeic...It was in this mythopoeic art that MacDonald excelled. The meaning, the suggestion, the radiance, is incarnate in the whole story: it is only by chance that you find any detachable merits... His genius hits us at a level deeper than our own thoughts or even our passions…and in general shocks us more fully awake than we are for most of our lives (18). MacDonald felt that a fairy tale could mean different things to different people, at various stages in their lives. 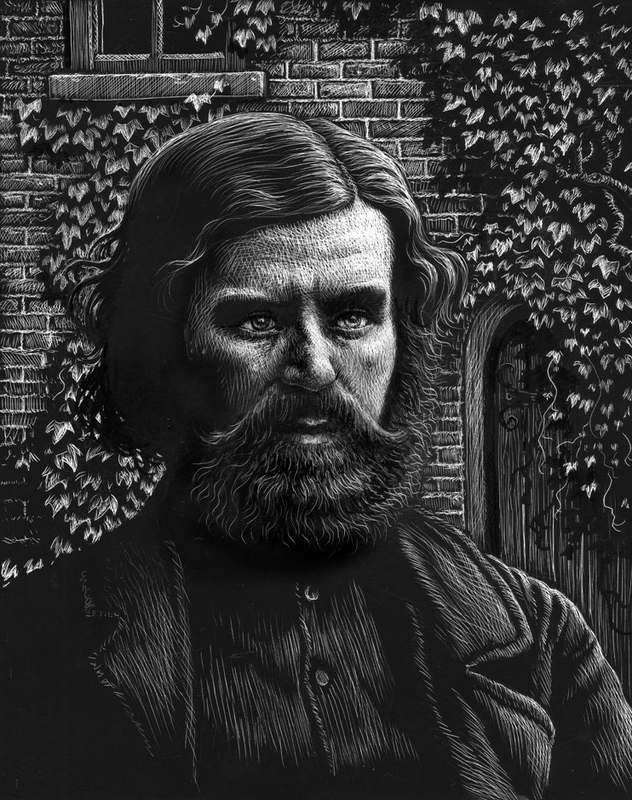 In his essay, "The Fantastic Imagination," the author states that "a work of art must mean many things; the truer the art, the more things it will mean... . Everyone, however, who feels the story, will read its meaning after his own nature and development: one man will read one meaning in it, another will read another." And should a reader’s opinion differ from the author’s, MacDonald allowed that “your meaning may be superior to mine” (Dish of Orts, 317). Emotions are not simply described to us; they are created within us. We are made to feel awe in the depths of our beings. The effects that one experiences are those that great myths have always created within man. This is not to say that MacDonald’s writings are sacred revelation, but to suggest that the open-minded reader may well have moments when he feels himself more near the ultimately Real than he has yet been (xviii). One way MacDonald achieves this sense of awe is by putting the characters through a variety of numinous experiences in fairyland that could not occur in our normal world. Importantly, time there passes at a different rate, so the story feels like it takes place in a mythic, liminal time. The characters age rapidly in a short span of time, for instance, then emerge from baths appearing young and renewed, suggesting they have died and are reborn to a higher existence. Death and resurrection are not a usual subject matter of fairy tales, which is why I would agree with a number of scholars who place "The Golden Key" in the category of a myth instead of a fairy tale, even though MacDonald himself labeled the story a fairy tale. His created world does contain motifs similar to those found in traditional fairy tales: a quest, a magical talisman, magical helpers, elemental wise men and a wise woman, to name a few. Magical elements aside, the themes found in traditional fairy tales tend to address every-day concerns, such as seeking one's fortune, finding love and marriage, and facing obstacles on the path of life—abandonment, outwitting nasty step-parents, and attempting to achieve impossible tasks, to name a few. Myths on the other hand, are often larger than life, representing concepts that cannot be adequately be expressed in words. Hein has categorized MacDonald's stories under the term "literary myth:"
Two types of myth exist: the ancient folk myths, emerging from the dream-time of man’s prehistoric consciousness, and modern literary myths, composed in historic time by men who possess mythic vision and command a mythic style (135)... MacDonald’s best attempts in literary myth, of which “The Golden Key” is an example, have genuine power. This power comes partly from the conviction he succeeds in arousing within his readers that he is exploring spiritual experience in an imaginatively significant manner...Successful myths rise to probe the ultimate mysteries of existence, simultaneously arousing the reader’s wonder and awakening in him a desire that these insights be true. The reader becomes convinced that they bring him into closer proximity to the Ultimate Mystery (155). 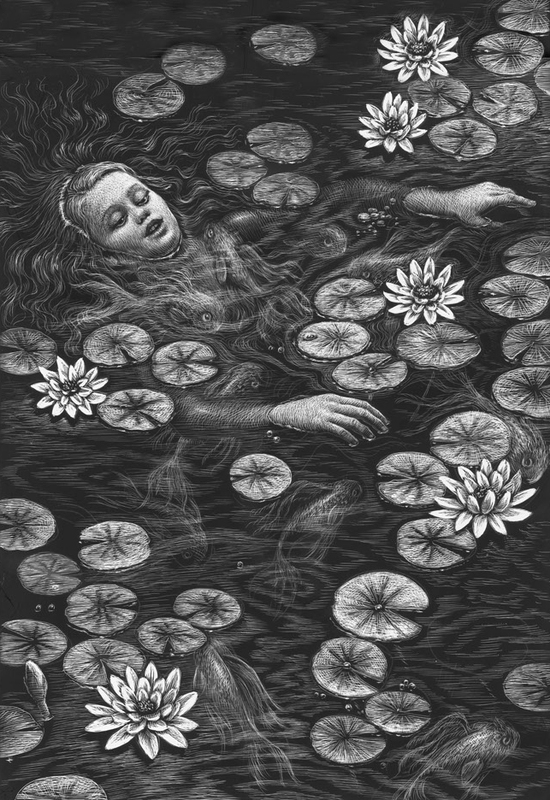 Traditional fairy tales do not usually tackle the "ultimate mysteries of existence." Fairy tale characters encounter trials, attain their goals—albeit with magical help—and then live "happily ever after." Although "ever after" has an element of never-ending-ness to the turn of the phrase, suggesting an eternal condition of happiness, possibly even after death. Though in the case of most fairy tales, the feeling elicited is that the characters will live happily forever in an un-named place that the reader might interpret as a heaven-on-earth. After all, the characters almost never die in a fairy tale, unless they are the villains and death is their just reward. The good get to live happily ever after. So, like MacDonald's story, most fairy tales do contain the hope for eternal life, but in a less explicitly spiritual way. Much of the material used for his children’s journey in “The Golden Key” is plucked from ancient sources devoted to explaining the nature of the soul’s migration both into and out of Hades. For accounts of these mysterious journeys, MacDonald resorts to some of the most insightful sources in antiquity: Homer, Plato and Virgil. With these and other ancient sources at his disposal, he uses his own Golden Key of the imagination to pen his puzzling, complex, yet rational story (117). MacDonald creates a unique creature of his own invention, the air fish—half owl, half fish—to present his opinion about death and resurrection. When Tangle is shocked because the Grandmother wants to eat the air fish that led her to the cottage, the Grandmother explains to her that “the ambition of the animals is to be eaten by the people; for that is the highest end in that condition.” The Grandmother goes on to explain to Tangle: “But they are not therefore destroyed. Out of that pot comes something more than the dead fish, you will see” (159). The air fish is not destroyed, but is resurrected, and passes into a different, even better, life. It becomes an "aeranth," a small creature with a human body and bird wings. MacDonald is implying that death is also the highest end of the earthly condition of humankind and thus nothing to be afraid of, because a better life lies beyond. The image of the fish is traditionally used as a symbol for Christ, and the sacrificial meal in the story can also be viewed as a symbol of the Eucharist. But MacDonald is also presenting his opinion that all life is evolving to higher spiritual forms, and that animals, not just people, are part of that process. This is not a viewpoint one normally finds in Christian dogma, showing another example of his diverse influences and philosophy. Another interesting attribute of the air fish is to confer upon those who eat them the ability to understand speech of animals, indicating that MacDonald felt that mankind should aspire to a union with the natural world, and that this union is essential to our spiritual growth. He confirms this idea in a number of his essays and sermons. The resurrection of the air fish serves to reassure the reader that death is not something to be feared. Later in the story this concept is echoed by the Old Man of the Sea, when he explains, "It is only more life," after Mossy realizes the Old Man of the Sea is Death, and that Mossy himself has died (70). But the moment she stood upright she had a marvelous sense that she was in the secret of the earth and all its ways. Everything she had seen, or learned from books; all that her grandmother had said or sung to her; all the talk of the beasts, birds and fishes, all that had happened to her on her journey with Mossy, and since then in the heart of the earth with the old man and the older man— all was plain: she understood it all, and saw that everything meant the same thing, though she could not have put it into words again (59). Such is the nature of the mystical experience —it is a feeling beyond words, a feeling of wonder that cannot be expressed in words. Her experience in the cave embodied the sense of the awesome unity of existence. Tangle's meetings with each of the Old Men have an equally great effect on her. The bath of the Old Man of the Sea restores her youth. The Old Man of the Earth moves a huge stone in the floor of his cave, revealing a dark hole. When Tangle points out there are no stairs, he replies, "You must throw yourself in. There is no other way" (57). After looking him full in the face for a whole year, she obeys. Some things must be accepted on faith. Some things must be experienced to be understood. 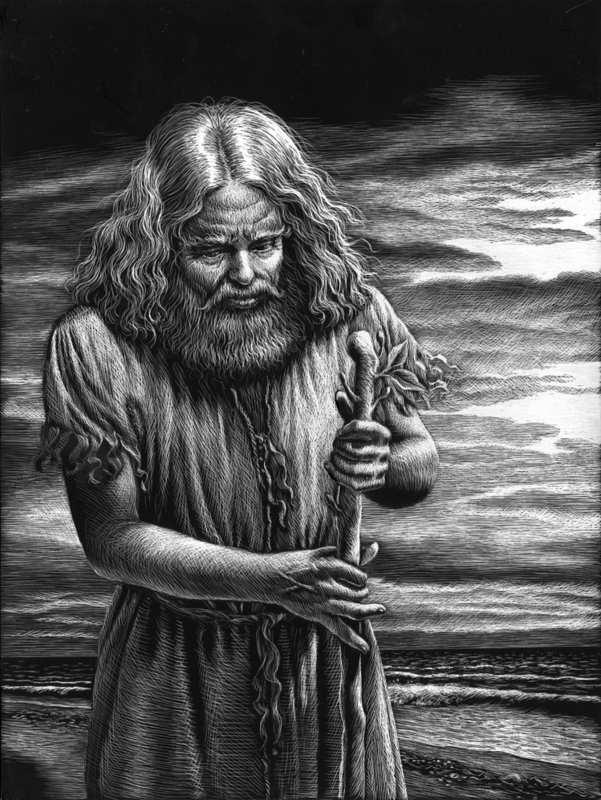 Having possession of the key seems to confer upon Mossy an elevated status—his way is above ground, and he walks over the ocean to climb a precipice and reaches the rock that he unlocks with the key, entering the chamber of rainbow columns where Tangle has been patiently waiting for seven years. Scholars have expressed various theories about the significance of the characters' divergent paths, and it is interesting to note that Tangle has reached this sacred place before Mossy, without the benefit of having a golden key. In the face of a predominantly empiricist and scientific culture, concerned to rationalize and demythologize the long record of man’s awareness of the numinous, MacDonald reasserts the value of myth and symbol, not as primitive relic, but as a vital and irreplaceable medium of human consciousness (22). Myths inspire the realization of the possibility of your perfection, the fullness of your strength, and the bringing of solar light into the world...Myths are infinite in their revelation (148)... It is important to live life with the experience, and therefore the knowledge, of its mystery and of your own mystery. This gives life a new radiance, a new harmony, a new splendor (163). As so many scholars and other writers have expressed, it is difficult to adequately describe the ineffable effect that this story has upon some readers, and how MacDonald achieved that effect. (59). To repeat C.S. Lewis's observation: "The meaning, the suggestion, the radiance, is incarnate in the whole story" (18). Feelings of wonder are fleeting and ineffable—the Old Man of the Earth's words are an apt metaphor for how to read the story: "You must throw yourself in. There is no other way" (57). Attempting to express the inexpressible, words are inadequate to truly unlock the wonder at the heart of this story. For me, as for MacDonald, feelings are the key. Like Tangle, I have difficulty putting into words why this story has held its appeal for me after first reading the story in 1976, but I will start by saying this: "The Golden Key" is an artist's treasure trove of intriguing visual imagery and symbolism. Reading the story close to forty years ago created in me a profound desire to some day create pictures that illuminated this evocative text. Since that time, almost forty years ago when I purchased a version of the story beautifully illustrated by Maurice Sendak, when people ask “If there was one book you’d like to illustrate, what would it be?” —one of my first answers has always been "The Golden Key." Over the years I have suggested the idea to a number of publishers, but no one was willing to produce such a long story as a full color picture book. I toyed with the idea of abridging the text, but quickly abandoned the idea—I love the story in its original form and it simply felt wrong to tamper with it. It seemed that my dream might never be realized. But then I had an idea. A few years ago it occurred to me, after re-reading the story for the hundredth time, which this very long fairy tale could readily be divided into chapters. I thought that perhaps a publisher might be more willing to produce it as a chapter book for ages eight and up, along with a significant number of black and white illustrations. I felt this was a more suitable age forthe audience of the story as well. But to conceive of illustrating the story in black and white, I felt that I had to come up with a striking style that matched the mood of the story, and would be as satisfying an experience for me as creating full color illustrations. The artistic challenge was to somehow express in pictures the moving experience of reading this story, and finding an appropriate art style was key to this expression. Imaginative Realism is a term used in recent years to define artworks in a realistic style, yet depicting a world imagined and created by the artist—scenes that looks completely convincing, but that cannot be found anywhere in the "real" world, often comprised of imagery with layers of symbolic meaning and supernatural elements. I felt this style of art would be a perfect complement to the mythic properties of a story like "The Golden Key." Most of my full color fairy tales and personal paintings can be placed in this category of art, but my medium has always been oils for those projects. Not having the option to work in full color oils for a chapter book, I considered various black and white styles that would suit the story and convey a mythic quality. 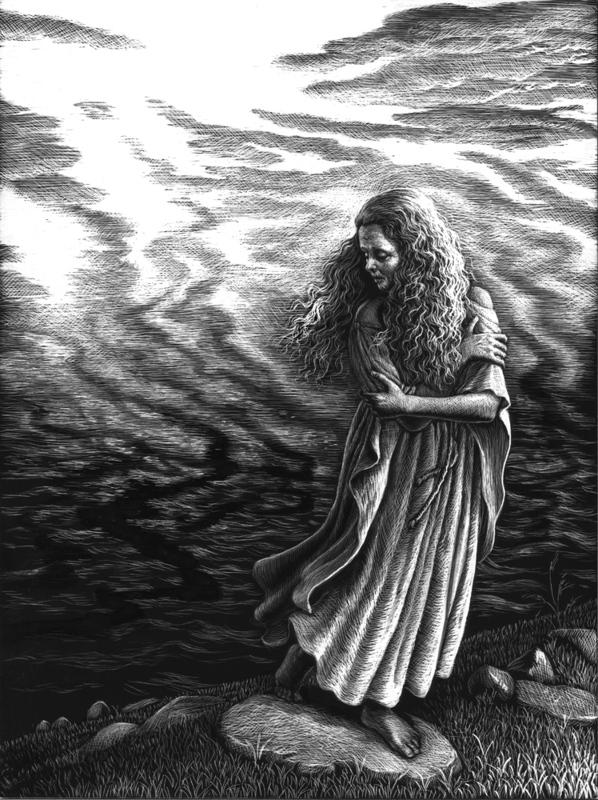 I decided that the black and white medium of scratchboard would be perfect to convey the dramatic sense of light and dark imagery in the story. I had done very few pictures in scratchboard, but have taken to the medium so much that I now prefer it to oils, something I never thought I would be saying. And happily, after showing six finished illustrations and a dummy with a total of over forty planned pictures in all, it was my good fortune to find that Eerdmans Publishing was willing to take on the project. ...these mischievous creatures were only the children of Fairyland, as it were, and there are many other beings there as well; and if a wanderer gets in among them, the good ones will always help him more than the evil ones will be able to hurt him (13). I decided to frame the story with wordless pictures, at the beginning and end. 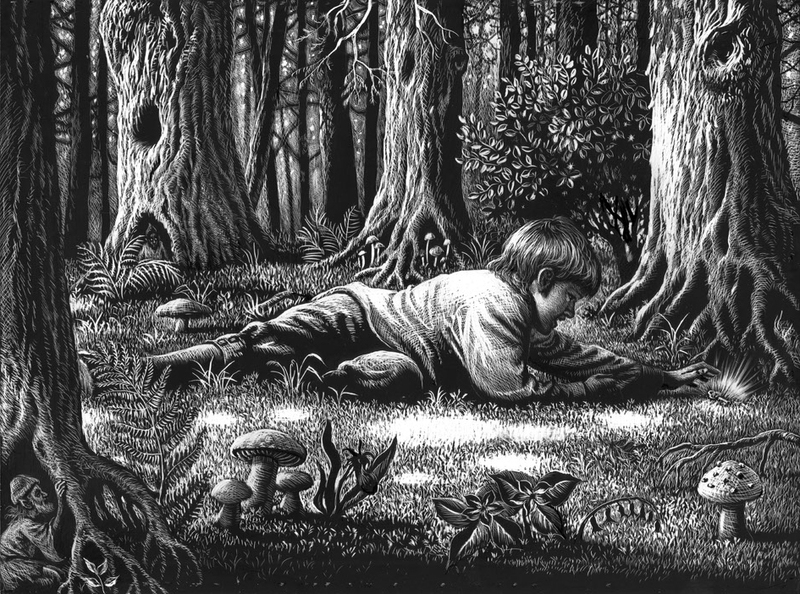 In the first, the point of view is from the forest, from Fairyland, where the creatures there are observing the boy listening to his great-aunt's stories. The fairy has the golden key, and I imagined her assessing listening to the conversation, seeing his spark of interest and curiosity in the boy's many questions, and his potential as a spiritual seeker. 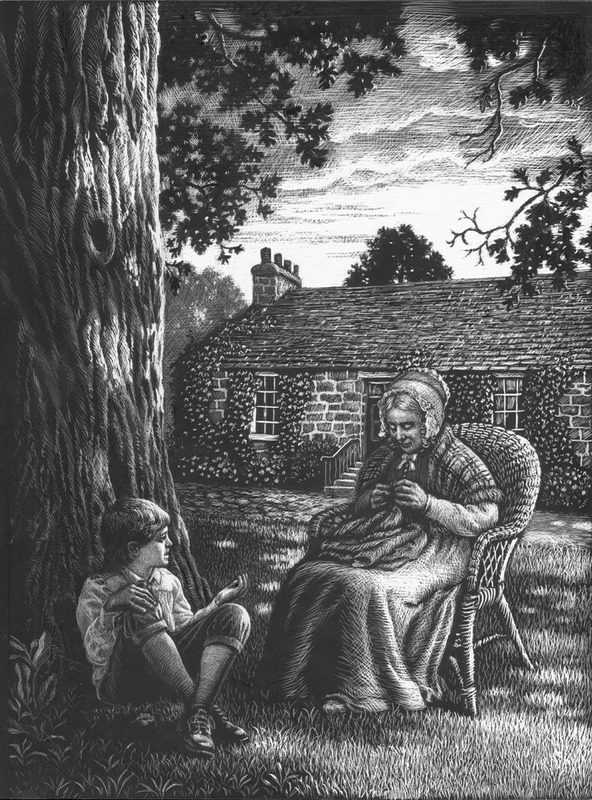 The text of the story begins with the boy listening to his great-aunt's stories, and I mirror the text in the illustration. However I bathe the scene in dappled light and shadow, prefiguring the sea of shadows later in the story. After their conversation, I added another wordless spread with the fairy flying off, carrying the key, indicating that she was going to plant it for the boy to find. The desire in him was surely kindled, for he could not resist dashing into Fairyland that evening when he sees the rainbow, a "grand sight, burning away there in silence, with its gorgeous, its lovely, its delicate colors, each distinct, all combining" (5). And at the end of the story, in the picture where Mossy and Tangle climb into the rainbow, the fairy is flying off with the key. I am suggesting here that theirs is just one story, one way to discover the wonders of fairyland, one way to ponder the mysteries of life and death and immortality. Mossy and Tangle's story is over, and the fairy has possession of the key once more. 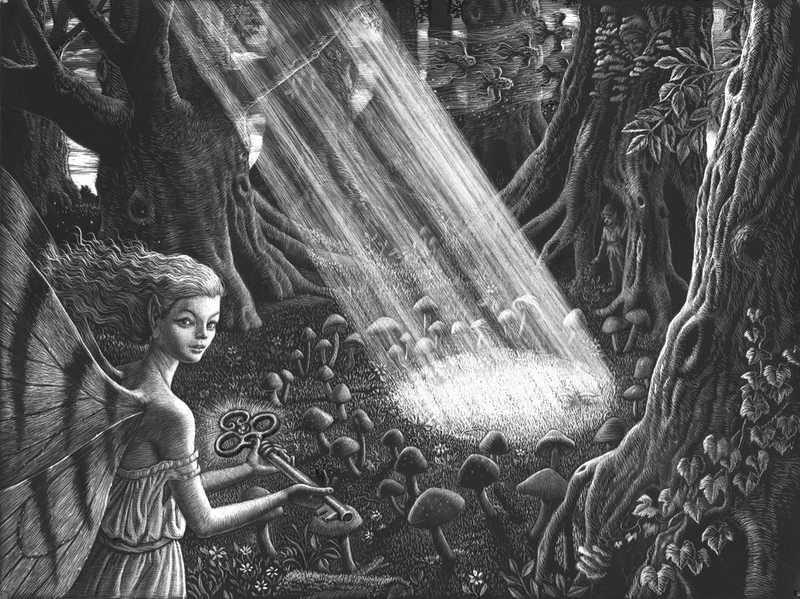 The final wordless illustration depicts the fairybringing the key back to the base of the rainbow for the next person to find. She looks out to the reader as if to invite participation in each person's individual quest for the key, to open the doors of imagination and wonder. MacDonald considered Fairyland to be a symbol of the imagination, and he invited each reader to ponder his stories and interpret them according to their own sensibilities. As an artist, I could not resist adding an additional visual narrative to the story, inviting the reader to probe the mysteries of existence. The majority of modern illustration styles primarily seek to amuse and delight, and do so with great effect. However, there is a continuing need for contemporary illustrations that, along with the text, convey a sense of wonder, depicting worlds that look real yet are imaginative inventions. These pictures expose the viewer to worlds that evoke the mysteries that define our human condition. An illustration is read, like a passage in a story, and just like the words, it can convey a depth of meaning beyond the literal. Young children appreciate fairy tales, myths, and their illustrations on one level, while older children and adults might plumb deeper meanings. And the pictures, like the gestalt of the story, do not need to be explained or understood to be felt— they simply need to be seen, and experienced. Ruth Sanderson’s love of fairy tales and fantasy began when she was a child, reading her father’s battered copy of Grimm’s Fairy Tales. This love grew as she spent much of her childhood in the woods playing in a pink castle in an abandoned theme park. Ruth has illustrated over 80 books for children, and her fairy tales have received much critical acclaim. All of the original artwork from her book The Twelve Dancing Princesses is now in the permanent collection of the Norman Rockwell Museum, where she had a one-woman show from December 2013- March 2014, featuring 64 oil paintings from her fairy tales. Her first art book, Golden Dreams, The Art of Ruth Sanderson was published in late 2013. Her latest book is A Castle Full of Cats (2015). The Golden Key is a current work-in-progress that will feature over forty scratchboard illustrations. It is scheduled to be released in the fall of 2016 from Eerdmans Publishing. Ruth is the co-director of an MFA in Children's Book Writing and Illustrating, offered during summer terms at Hollins University in Roanoke, Virginia. Her website is ruthsanderson.com. George MacDonald's Fantasies for Children. Robert McGillis, ed. Metuchen, NJ: Scarecrow Press, 1992. Campbell, Joseph, and Bill D. Moyers. The Power of Myth. New York: Doubleday, 1988. Hein, Rolland. The Harmony Within: The Spiritual Vision of George MacDonald. Grand Rapids, Michigan: Christian University Press, 1982. Lewis, C.S. George MacDonald: An Anthology. NY: Dolphin Books, 1962. MacDonald, George. "The Fantastic Imagination." A Dish of Orts: Chiefly Papers on the Imagination and on Shakespeare. London: Dalton, 1908. ---. The Golden Key. Maurice Sendak, illus. and W. H. Auden, afterward. New York: Farrar, Straus and Giroux, 1967. McGillis, Roderick. ed. 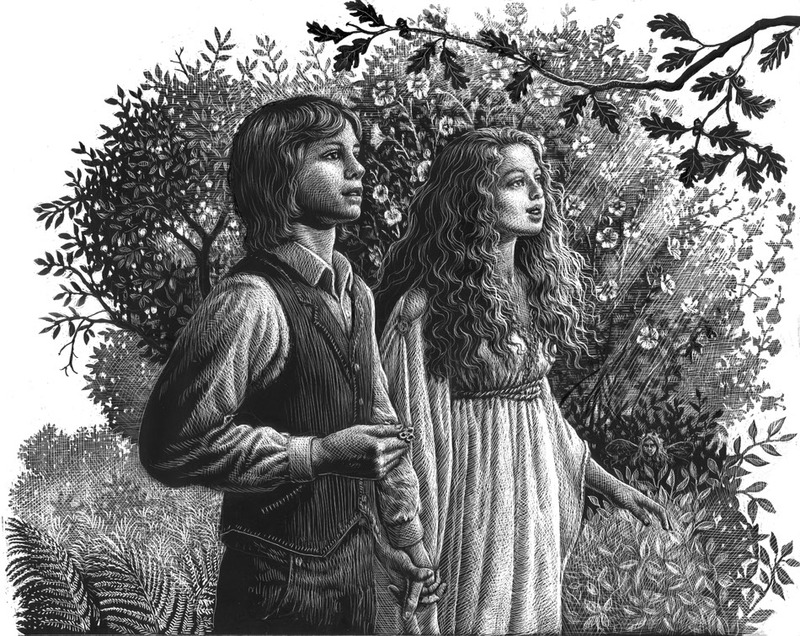 For the childlike : George MacDonald's Fantasies for Children. Metuchen, NJ: Scarecrow Press, 1992. Mendelson, Michael. "The Fairytales of George MacDonald and The Evolution of a Genre." For the Childlike : George MacDonald's Fantasies for Children. West . Robert McGillis, ed. Metuchen, NJ: Scarecrow Press, 1992. Prickett, Stephan. “The Two Worlds of George MacDonald.” For the Childlike : George MacDonald's Fantasies for Children. Robert McGillis, ed. NJ: Scarecrow Press, 1992. Soto, Fernando. "Unearthing Ancient Sources in George MacDonald's 'The Golden Key.'" North Wind: A Journal of George MacDonald Studies, 2007.